Apple says sorry to users over Apple Maps | What Hi-Fi? Apple CEO Tim Cook has apologised to its customers for "falling short" over Apple Maps. Cook promised the service would be improved but recommended that users could in the mean time use rival services such as Google Maps and Microsoft Bing. Apple has removed Google Maps from the latest version of iOS, iOS 6, and replaced it with its own Maps app. Unfortunately, Maps has proved less than 100% accurate, with blogs and websites reporting numerous inaccuracies and anomalies. 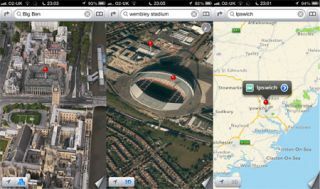 A blog collating the pictures called 'The Amazing iOS 6 Maps' neatly illustrates some of the errors. Read our iPhone 5 review. While apologising to consumers isn't entirely new territory for Apple – Steve Jobs admitted Apple wasn't perfect over the issue with the iPhone 4 antenna – recommending competitors' products is certainly a break from the norm.